Modern Services was established in 1965 as Modern Air-Conditioning Inc., and from 1998 to 2014 was doing business under the name Modern Service for Home and Business. Our former “sister company,” Anderson Service, was established in 1961 as R.L. Anderson Inc. By 1980, Modern Service and R.L. Anderson combined and became the largest mechanical contractor in the region. In 1986, Elliott-Lewis Corporation purchased Modern Air-Conditioning Inc. At the end of 2014, R.L. Anderson Inc. merged with Modern Air-Conditioning Inc. and since then has been doing business as Modern Services, an Elliott-Lewis Company. Modern Services initially focused on installing, servicing and replacing air-conditioning systems in homes and businesses in Southwest Florida. Today, we are a full-service company for all your air-conditioning, heating, and electrical repair and service needs. Today, Modern Services provides so much more than air-conditioning installations, service and replacements. Together, through the reach and reputation of both companies and with the support from our parent company, we are able to take care of homes and businesses in nine Florida counties from Collier, Lee, Charlotte and Hendry in the south, to Manatee and Hardee to the north. Elliott-Lewis Corporation has a proud tradition of service that dates back to 1905, when Thomas H. Lewis Sr. and Frank R. Elliott started Elliott-Lewis Electrical Company. The two 21-year-olds had the vision to help electrify cities in the Philadelphia area with lighting and telephones. Their business grew in the early part of the century when appliances and other equipment came into play. The depression brought tough times, and in mid-1932, Lewis was looking for ways to expand the business. A meeting with General Motors introduced him to a new product that would revolutionize home heating — the automatic oil burner. By the winter of 1934-35, Elliott-Lewis was the largest oil burner distributor in the world. After GM’s Frigidaire Division introduced the commercial air-conditioning unit in 1934, Elliott-Lewis entered the HVAC business and installed the first commercial air-conditioning unit in the Delaware Valley. Maintenance contracts were offered to cover all the equipment sold and installed by the company. Many of those original customers maintain their relationships to this day. Throughout this century, people have relied on Elliott-Lewis to make their lives more comfortable, more convenient, and more productive. Although the company’s products have changed throughout the years, its commitment to customer service has never faltered. 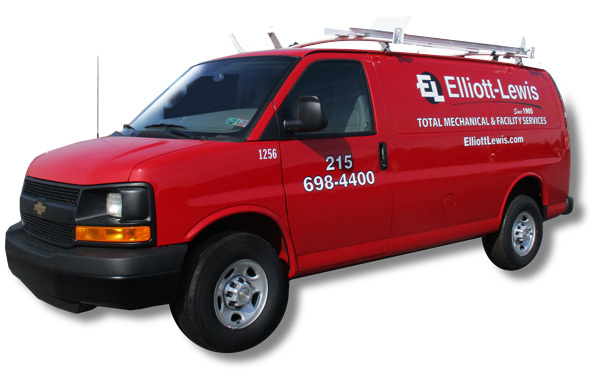 Elliott-Lewis now has over 500 employees, and services customers from their headquarters in Philadelphia and four other locations.